beet and cucumber salad in a cool mint yogurt dressing… and not so peaceful summer nights! Hello, everyone ! Still hot over here in central France, although not as bad in the U.S.* This recipe is about something refreshing and easy to make – please don’t go by the photos, dear neighbors : I turned my simple salad into fancy « verrines » because we had people over. The small portions in transparent containers served as appetizers. 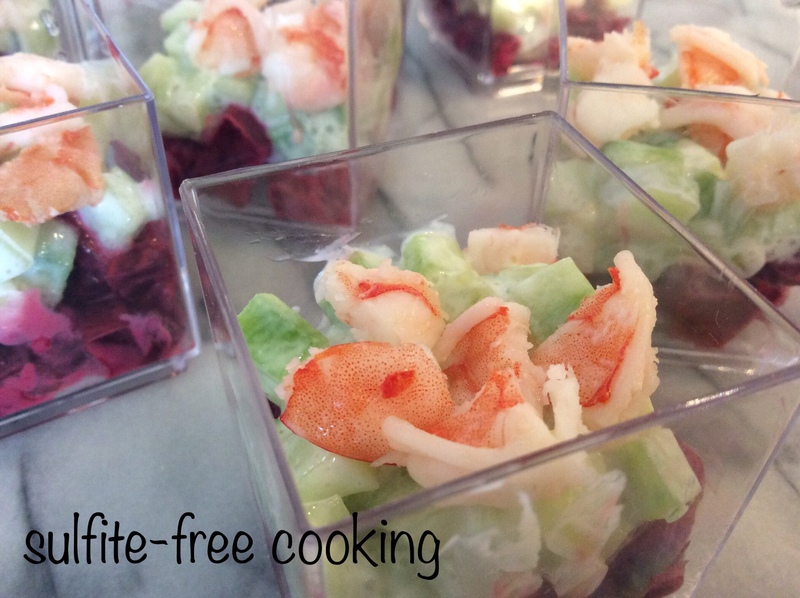 For more color, I added sulfite-free shrimp (in the U.S. Nature’s Promise sells them raw, frozen, guaranteed untreated, and successfully tested several times on my husband) but I usually make the salad without them. And when it gets really hot I really don’t feel like eating anything other than vegetables anyway. Mint and beet go nicely together. Fancy trying ? 1. Make dressing : mix together 120g /4 fl oz non-dairy yogurt (I have tried both soy and coconut yogurt, with no notable difference as the flavor of the mint takes over), 15ml / 0.5 fl oz freshly squeezed lemon juice, ¼ tsp unrefined sea salt, 1 ½ tsp fresh mint leaves, chiseled, and white pepper, if desired. 2. Cut 200g / 7 oz cooked beet (I hope you can buy it already cooked, definitely a time saver!) and 150g / 5 oz cucumber (that’s net weight, after peeling and removing seeds) into dice. Add dressing. NOTE : If you decide to make verrines, the beet and cucumber should be kept separate ; you need about 2 to 3 TBSP dressing for the beet and 4 TBSP for the cucumber. We do not have A/C but manage to stay reasonably cool. First of all, as night temperatures do get comfortable enough, we open some of the windows to let cool air in. We live in the countryside, and are not really worried about burglars or the constant sound of cars driving by. It is indeed quiet. Well, sort of. I somehow have the feeling we were earwitnesses to a horrible crime last night… Something (a duck in the neighborhood? An owl ?) screeched bloody murder for a long minute around 2 a.m… 😰😱 Nature can be vicious!!! No, this is not a genetically modified hydrangea! I love this salad, and as I make my own soy kefir, it’ll be very easy to do. Your verrines look festive, and now I am tempted to start creating verrines. It’s all your fault, dear Joelle! Oh, thank you Dolly. I have been a bad neighbor lately, keeping to myself more than normal, not visiting other neighbors’ blogs… and yours in particular. On the subject of verrines, they are usually a big hit. The one rule to remember is to try to have three to four different layers, varying in color and texture. Then the real challenge resides in not getting the glass smudged when making the layers! I will follow your expert advice, dear Joelle! I am making Mojito cakes in wine glasses for this Friday, andthe company is rather small, so I’ll have a few plastic glasses left – perfect for experimenting with verrines. Yum, yum! Let me, no, let everyone know if you make verrines (which my spell check keeps trying to change into “vermine” 😄). You take such nice photos, I’d love to see them, Dolly! Love the presentation of the dishes!!!! Thank you. It is pretty but time consuming — I don’t bother unless we have guests: a pretty table is a nice way to start a meal!